You can see a "BlogThis!" button in the blogger official share buttons set.When other blogspot user click on this "BlogThis" button,he/she can share your blog posts easily through Blogger. 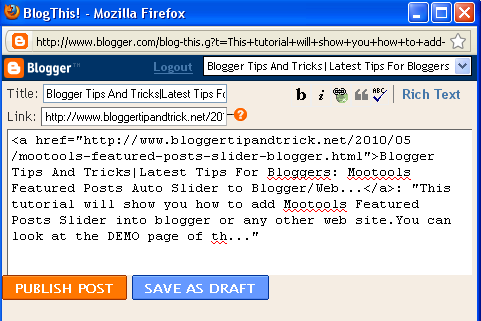 But if you want to add this "BlogThis" feature to your blogger blog as a Text Link,then this tutorial will helpful for you. Now follow the steps given below to add "BlogThis!" feature as a text link to your blogspot blog. 4.Now copy the code given below and paste it just before the <data:post.body/>. 5.Save your template.Now you can see a "BlogThis!" link in your every blog post(not homepage).